Never trust a robot to do a Judge’s job. 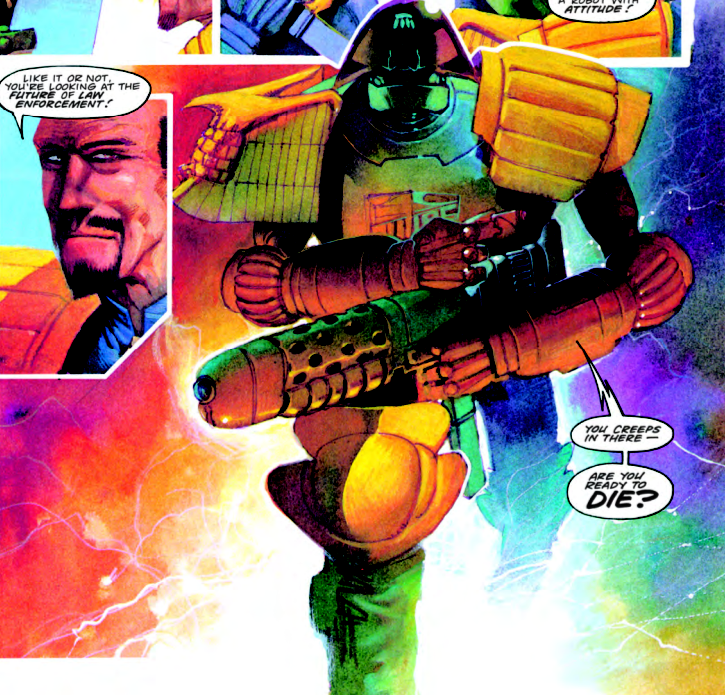 Although robots have been a part of Dredd’s world since the beginning, it wasn’t until the fallout of the events of Judgement Day that they were given the authority to act as Judges. It…doesn’t go so well. 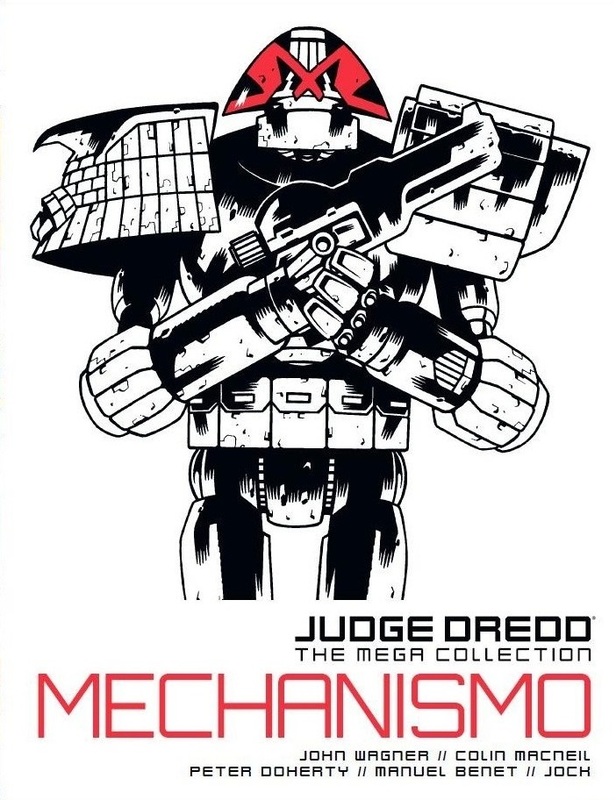 Collecting the three-part Mechanismo story line as well as two shorter Dredd tales, this second thematic anthology has Wagner examining the cold robotic nature of what it means to be a Judge by extrapolating if there is any human element to the job at all. The collection as a whole is a mixed bag and not nearly as impressive as the prior entry into the Mega Collection, America, but it’s a fun look at what it means to put too much faith and too much power into convenient technology regardless of good intentions. Plus, it’s hard to argue with a selling point that is pretty much futuristic militant policemen shoot evil robots while things blow up. Originally published in 1992, the opening chapter by John Wagner and Colin MacNeil is the strongest of this collection and introduces the Mechanismo Mark I robot judges in the wake of a severely depleted Judge force. It is unquestionably intriguing and clever in its delivery as Wagner uses these soulless automatons to take the idea of Judge Dredd to its natural, extreme conclusion. The key element to the story is that the Mechanismos are programmed to reflect Dredd’s own comportment and therefore we see what a Dredd fully devoid of humanity would look like. Considering the signature scowling, austere demeanor of Dredd, the idea that human emotion is holding him back from being more efficient is an amusing and captivating affair. Obviously against the notion from the offset, Dredd aggressively warns of the potential for danger that removing the human element from law enforcement would cause and makes his feelings quite clear to Mechanismo project-head Judge Stich and Chief Judge McGruder. His Drokk damned warnings fall on deaf ears of course and soon the ten robotic Judge units let loose in Mega-City One begin to malfunction because of course they do. The result of an overheated resistor, the robots lose their behavioral inhibitor and essentially have an overload of machismo, or rather, mechanismo. Get it? 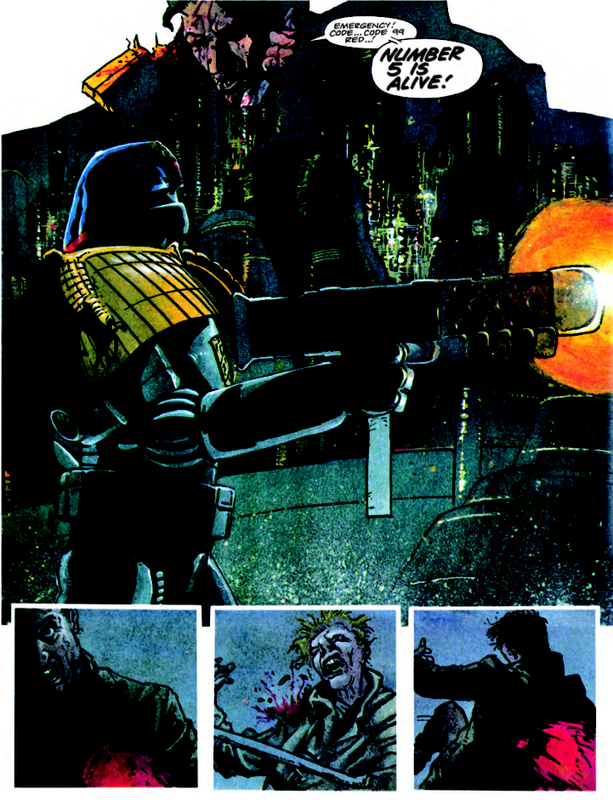 Wagner delivers what is ostensibly an evil robot run amok story, but is really examining the dangers of what it means to go one step beyond Dredd; that is, to fully bring about the cold, strict fascist reasoning of the law without any trace of empathy. The robots are what Dredd is close to becoming, what many a Dredd fan might have already thought he was, if not for that essential human component to empathize in order to fully assess a situation. Colin MacNeil’s acid-washed painted art brings a ton of flair and atmospheric horror to Mechanismo. There’s an electric crackle to his art, a scratchy finish that’s reminiscent of Sienkiewicz while still conveying a wide range of emotions – something not particularly easy to do with robots and Dredd alike. Everything is densely textured from the curled upper lip of a snarling Dredd to the battered and worn metallic finish on virtually every non-human in the book. What’s most astounding about MacNeil’s efforts is how bright he’s made a world that’s very often depicted as a dark and hopeless existence. Beyond just having the majority of the tale be set during the day time, MacNeil has made the world feel like a psychedelic journey with his high frequency hues and hazy blur that washes over each page. The design for the Mechanismos is both comical and intimidating with their enormous stature and their exaggerated under-bites that lampoon Dredd’s most well-known features. Of all the tales found in this collection, MacNeil’s is by far the most rich and striking. The next two chapters of the trilogy, Mechanismo Returns and Body Count, are both much more straightforward action stories than their predecessor. There’s no new thematic examination, instead Wagner’s script for both these tales follow the continuing chaos that is Unit #5 as it continues its stark, dedicated mission to fulfill its misguided view of the law. While it’s still plenty fun and gory, it does feel a bit repetitive, especially in regards to dialogue. One can only read the word “creep” so many times before it loses all meaning. Instead the biggest takeaway from both is the declining mental state of Judge Stich and the questionable decision-making of Chief Judge McGruder, which ties into other stories from around this time. For the purposes of this collection though, these tales feel very much like straight sequels lacking any tangible substance outside of good old-fashioned gritty robot violence, which isn’t without its charm. Peter Doherty turns out appropriately muddied and gritty art for Mechanismo Returns, feeling like a modernized grounded successor to MacNeil’s eccentricities. Doherty is significantly darker than MacNeil and not nearly as exaggerated, but the grainer quality to his art really lends itself well to the more horror-centric follow-up. It’s this style that makes Manuel Benet’s look oddly out-of-place by contrast. One of the difficulties that anthologies have that can sometimes have is the discordant nature of multiple artists with varied styles following one after another. It typically works just fine when stories are only thematically linked, but with the Mechanismo tales, we have one single story line that radically changes presentation from chapter to the next. Bennett’s style comes across as dated, especially following Doherty’s outing. He’s a talented artist, no question, but the shift feels like going from a modern-day comic to something resembling the box art for Streets of Rage. It’s pillowy soft in its use of watercolor, but most figures are confusingly stiff. There’s great moments (Unit #5’s gradual damage is stellar stuff) and as a stand alone tale it would certainly catch your eye, but as a the final part of a trilogy it feels disconnected to what has already been set up. This collection includes two other short tales dealing with artificial intelligence gone awry, but neither feels particularly tied to the Mechanismo trilogy in spirit. Wagner scripts a satirical look at bureaucracy in S.A.M. wherein a citizen is driven to extreme measures as the result of falling victim to government’s intentionally complex practices. It’s quite funny and is structured like a long-form joke, with Dredd ultimately delivering the punchline by putting the antagonistic robot bomb (the titular S.A.M.) into a logical paradox. That in turn, reflects the bureaucracy that set the events in motion in the first place. Val Semeiks provides pencils with Cliff Robinson on inks and Chris Blythe on colors and the visuals reflect the comedic tone perfectly. The colors are appropriately bright whiles trying flat atop the somewhat cartoonish figure work of Semeiks, and the amount of emotion pouring forth from what is essentially a faceless robotic bomb is a testament to the art team’s comedic sensibilities. Finally, in the last story collected, Safe Hands, there is a visual treat of a tale that echoes the warnings of the opening chapter. Top of the line medical droids begin to treat their patients to the best of their abilities: by killing them and thus removing all pain and suffering per their programming. There’s not a ton to dig deep into, but Gordon Rennie is clearly having fun poking at corporate greed. Jock crushes it on pencils, obviously, positioning Dredd into moments of animated superheroic splendor only to have his signature sharp shadows ensure the proper rigidity. Chris Blythe also has a field day on colors, simultaneously keeping things dark while having a hi-ex level of pop to everything on the page. His blended backgrounds are especially noticeable with their multi-media flair and application. It’s a gorgeous story to look at, if only it weren’t so short. 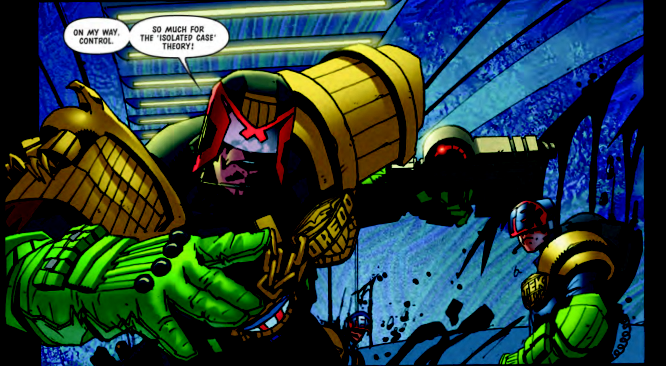 All together The Mega Collection Book 2 is a step down from the first volume, but it’s still quality Dredd. What’s the next logical step to an entire corps of near-robotic law enforcers with the ability to play judge, jury and executioner? Actual-robotic law enforcers with the ability to play judge, jury and executioner, which in turns paints the Judges in a light not normally seen. There are times where the reader actually sympathizes with Unit #5 even as it massacres its way across the megalopolis, but ultimately await for its deserved destruction. Taking a look at the dangers of creating an actual black and white world, Wagner’s Mechanismo delights in bringing the authoritarian Judges to their extreme and injecting just the slightest glimmer of humanity into the heavily epauleted fascist guardsmen. Suffering a bit from constantly shifting visual experience and a repetitive narrative, this collection doesn’t quite hit the mark, but it’s still rife with enough signature Dredd moments and conceits that it’s well worth checking out. Just be sure to keep a close on your Roomba after you do.